Quick links: MFYBAL overview, weeks 1, 2, 3, 4, 5, 6. Welcome to Week 6 of the Monster Feet Yarn Bomb Along! Woo hoo, we made it! The last week of the Monster Feet Yarn Bomb Along is finally here … so how’s the installation going? This week we have some installation tips and we’re also sharing a selection of your amazing monster feet yarn bombs. We’re so impressed with all of your great work! Remember, just because it’s the last week of this yarn bomb along, you can always join in anytime, forever more. All the resources will remain on the web! Each week is listed at the top and bottom of each post for quick reference. Bring tools! At minimum you’ll definitely need extra yarn for sewing and securing your yarn bomb, a tapestry needle, and scissors. Depending on where you plan to install your monster feet, other tools you might need include: a stapler, cable ties, wire, elastics, a flashlight, sunscreen, a step ladder, and/or a crochet hook. Some people sew their yarn bombs to install them, while others use cable ties or both – you can decide what’s best, depending on the structure you’re attaching to. Think about things like rain (water can weigh the yarn down), accessibility (will it be touched a lot? ), etc, when deciding which method to use. Tag your piece … but this is 100% optional … many yarn bombers like to tag their work so people know who made it. The decision to remain anonymous or shout it out to the world is completely up to you! Take pics, share them on the interwebs and remember to use hashtag #MFYBAL! We trolled Twitter and Instagram to put together this selection of your wonderful monster feet yarn bombs. Click on the picture to be taken to the maker’s post. Want more? Check out the #MFYBAL hashtag on Instagram here and on Twitter here. BIG THANKS to everyone who participated in the very first Knits For Life Monster Feet Yarn Bomb Along! Welcome to Week 5 of the Monster Feet Yarn Bomb Along! It’s the home stretch! This week we crochet the optional claws or toenails. If you’re making the bare version, you get a week off. Next week we’ll install our monster feet! Remember, it’s never too late to join in! Go at your own pace, fast or slow. All the resources will remain on the web! Each week is listed at the top and bottom of each post for quick reference. In lieu of our usual silly video tutorial this week, we are going live! We’ll hook up a claw and a toenail and discuss what’s been happening in the forum. This is a great chance to ask questions and get our feedback before installing next week. Or maybe you’ve jumped ahead and want to share how it went. Chat at us in the live video! To tune in, hop over to our Instagram or our Facebook page at noon Pacific time on Sunday, June 3. Look for our “Story”. You’ll see options to comment during the broadcast. We’ll all see a live stream of your comments that we can chat about. Don’t worry if you miss it. After we go live we’ll post the video here. The pattern is pretty straightforward this week. You’ve learned all the skills needed for these embellishments elsewhere. A couple tips for shaping and placement. Claws should be very lightly stuffed to maintain their shape. It’s easy to overdo it and get a sausage-looking claw. An unstuffed claw may actually look pointier than an overstuffed one. You can also pull and prod your “cone” into shape a bit. Play around with where you sew them to the toes. Maybe a little higher for a bear claw look. Or at wacky angles for a monster-y look. You can even angle them by sewing one side a row into the claw so it points that direction. Toenails should be rounded on one side and flat on the other. The flat side is the tip of the toe, and the round side is the “cuticle”. The last round makes a nice finished edge. To maintain this while sewing it on, thread the yarn just “below” the front and back loop of that last round. Watch our live video for clarification here. Until next week, see you online! Welcome to Week 4 of the Monster Feet Yarn Bomb Along! This week we crochet the Leg section of the pattern. It’s pretty quick work, so we’ll spend some of this post sharing your stories from the past three weeks. Next week we’ll add optional claws or toenails. Our forum is full of amazing crocheters! Wow, we’re amazed at what a phenomenally experienced group of yarn bombers and crocheters are hanging out in the MFYBAL forum! We wanted to point this out because the forum is poised to be an excellent resource. If you have a favorite yarn bomb, there’s a good chance the person who made it is in the forum. So go wild and ask all those questions you’ve always wondered about. What are your fears about the upcoming installation? Do you have any tips for people who are doing their first yarn bomb? Nothing is off topic! Here’s some past work by the talented members of our forum. As we are starting to see monster feet in the wild, we wanted to give some shout outs to the interesting locations and stories you shared in the forums and on social media so far. Remember you are not behind! The purpose of our sharing these is not to stress you out or make you feel behind. Rather, it’s to provide you with some interesting tips and stories to mull over as we approach the final week’s installation. Go at your own pace and keep sharing your stories! Pyganies found the world’s funniest bench for a pair of Monster Feet on her school campus. Someone was sitting on it waiting for the bus, but she wasn’t deterred. We are giving Pyganies a virtual Ounce of Preparation badge (ʘ‿ʘ)ノ✿ for putting a separate needle and thread on each foot so she could install as fast as possible! Pyganies came prepared for a flash installation on the worlds best bench for feet. A Green Toe badge (ʘ‿ʘ)ノ✿ goes out to rckh2o in rural Nebraska for getting her feet wet with yarn bombing. Because her small town lacks anonymity, she’s starting her journey toward becoming the crazy yarn bomb lady with monster feet in her own back yard garden. We think this is a great idea! Like we’ve said, Lorna over here is secretly a selfish yarn bomber and loves to put pieces near home. If you’re still on the fence about where to put your monster feet, take a tip from Naomi. “I’m nervous about stepping out of my comfort zone… and attempt FEET aarrgh. But I know the local kids will LOVE them.” What did Naomi do with her nerves and monster feet? She secretly installed her first pair outside a friend’s office as a surprise! One is Silver and the Other’s Gold badge (ʘ‿ʘ)ノ✿ for Naomi. Now she says she’s hooked and is already hooking up some jumbo feet by holding the yarn double and using a jumbo hook. Can’t wait to see how they come out! Naomi dealt with her nerves by planting the feet near a friend’s place as a surprise. We love this “screech” of the record needle Lorri did upon seeing a sad bench in need of some love. “These monster feet were originally going to grace a USPS mailbox but the… bus stop looked so sad, that it got covered first. A regular rider waiting for his ride proclaimed them ‘Dope! '” Toes on Fleek badge (ʘ‿ʘ)ノ✿ for the custom tag! It looks like this was a difficult spot to sew in and we also are dying to know if the feet stretched to fit or did you adjust them for the bench? Lorri went rogue and repurposed feet she made for a mailbox after seeing this sad-looking bench. Alex has a warning for us all: double check your bag and checklist before heading out to yarn bomb. On his way home from work he planned to install his first pair of feet, only to realize one was missing. Gah! He had to wait all night to see if he left it at work or dropped it and lost it forever. Fortunately it was hiding under a table at work, yay! Gonna hand Alex’s this chocolatey Butterfingers badge (ʘ‿ʘ)ノ✿. Alex’s three-toed variation in East Harlem. Ok, last fun story. Jen has yarn bombed lots, but told us it’s with growing trepidation since several of her pieces have gone missing. For MFYBAL she asked the library if she could do the bike rack. Great idea! The more work you put into something, the more you risk by installing it guerrilla style. Getting permission not only can help your nerves but provide some reassurance it won’t go missing. In our experience, yarn bombing overwhelmingly leads to more positive things. And it did! “Amazing news. Library loves the idea. So much so they want to do a program around it!! I’m so excited. Thanks for the support guys.” Jen is saving the library for a bigger project since the risk is reduced. Smart Cookie badge (ʘ‿ʘ)ノ✿ right there. We can’t wait to see where she puts her monster feet. Hop on over to the MFYBAL forum and let us know how it’s going for you. Before we get crocheting, we wanted to give a shout out to all the people who shared their week 3 progress. You guys are killing us with how much fun you’re having over on Instagram with these #mfybal posts and stories. Keep them coming, and remember to follow each other too! OK let’s get down to business with this week’s crocheting. If you’ve always made crochet stitches in the top of the row below, you’re about to go crazy and try something new! Crocheting is so sculptural and permissive. You can put the next stitch anywhere you want, really. So let’s do it! Check out the video tutorial above or follow along here with the photos. Notice how your flaps from last week are splayed out to the sides to wrap around the pole. Now we need to build height with rows parallel to the ground. We’re just going to pretend our work so far is one big rectangle and keep going. Yep, we can totally do this: crochet lets you do whatever you want! How many stitches are in this new row? It depends on how big around your pole is and how big your stitches are, so the pattern can’t say. Typically you’d make a swatch to determine your stitches per inch. But that’s a waste of time because we have two swatches right here in our flaps! If you get lost with swatching, the pattern has distilled it to the essentials for you. Just plug in the numbers and you get the number of stitches in the leg rows. Number of stitches in leg row = (circumference of the pole / width of the flap row) x 12. We got 20. Notice in the photo below that one row is worked across the top of entire piece. To evenly space the stitches, it helps to mentally divide your work into quarters. Put one quarter of the stitches in half of one flap, and so on. 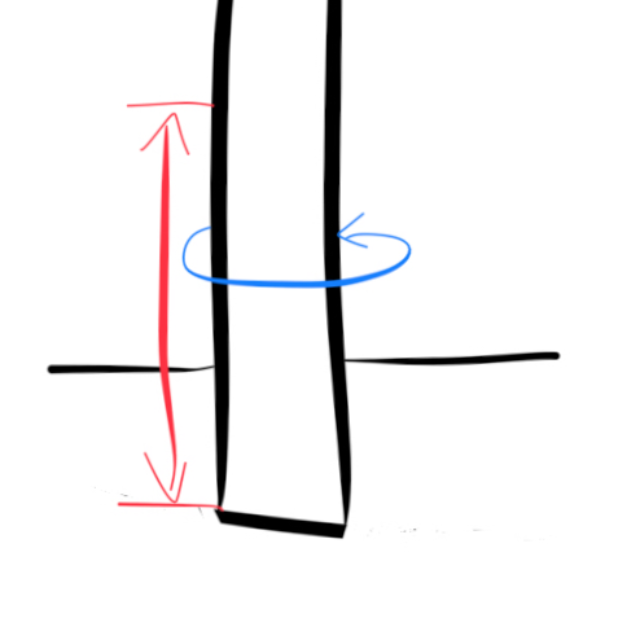 What if my pole isn’t straight? Beth had this question in the forum because she’s doing a tapered chair leg. Since this is a small project and we don’t need to worry about wasting yarn, just make the flaps and leg to the largest circumference. When you install you can overlap the narrow areas to get a tailored fit. So, keep crocheting until you reach your measured height and this project is almost done! Next week we’ll be back for the toenails and claws. We look forward to seeing what you’re up to this week! Welcome to Week 3 of the Monster Feet Yarn Bomb Along! This week is the bulk of the pattern. We’ll connect the toes into one big round and do the Foot and Heel sections of the pattern. Next week you’ll finish the Leg section. So how did crocheting your monster toes go? The #mfybal hashtag on Instagram is full of colorful toes! Some fun variations popped up: 3-toed feet and a jumbo pair made with a 9 mm hook. We loved seeing your creativity–keep the progress pics coming! You should have finished the last toe with the yarn still attached. If you cut it, just tie the end to the ball again, knots and all, because “it’s just a yarn bomb!” If you want to get fancy like in our video tutorial, here’s another good video showing how to join yarn with a slip stitch. OK, let’s join the toes. 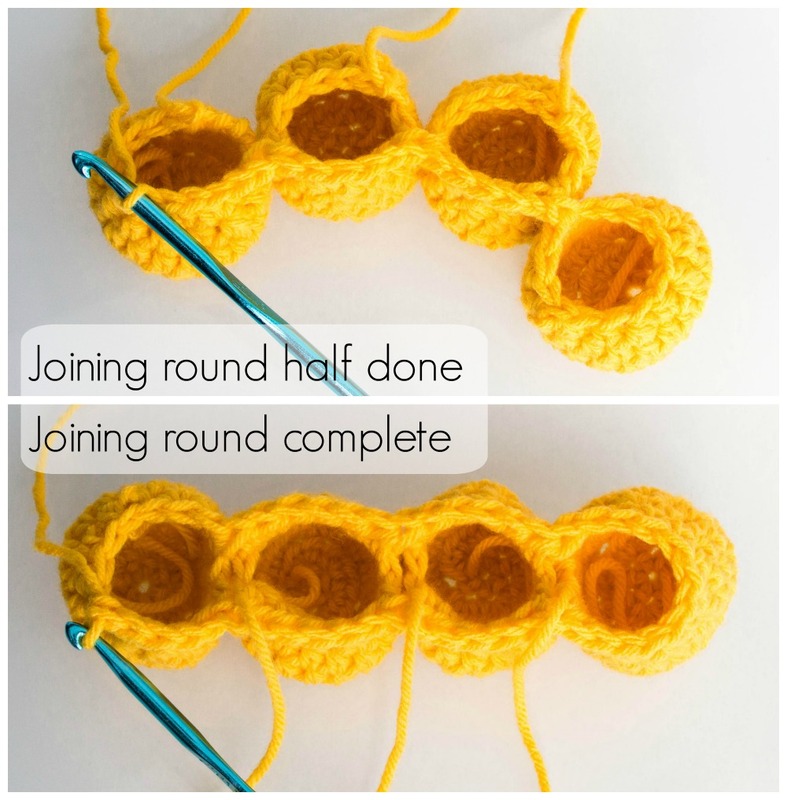 The joining round turns four separate toe rounds into one big foot round by crocheting continuously from one toe to the next. No special tricks or techniques. Just keep going. This is a big secret behind most of our silly characters, and now it’s yours too! In crochet, the next stitch can really be made anywhere, giving rise to endless possibilities. Here’s a closeup of where to put the first hdc in the second toe. Here are your toes all joined up along one side, then the other. Now you have one big round for the foot. Thing are literally taking shape now! Notice we tucked the toes’ starting tails in, but left the toes’ ending tails out. 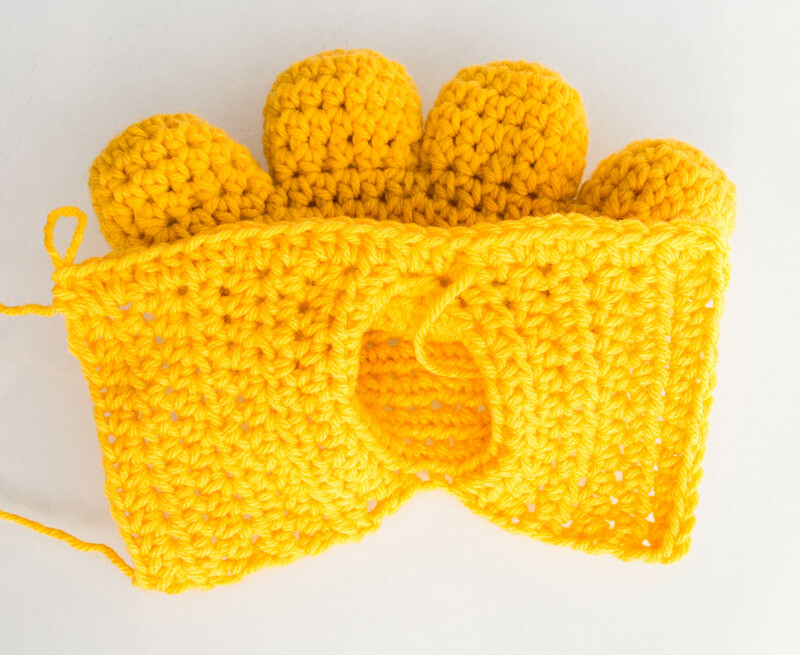 Let’s talk for a sec about the bond a crocheter’s hands have with the work and hook. Death grip. Mind meld. It’s so easy to pick up your work and a hook. Letting them go? If you’re anything like us, you’ll go ten extra rounds and move some furniture to avoid interruption. That said, if you want to sew the holes later, you can. Take it as a tip from having made these a million times: this is the simplest solution to these gaps. Also, the size and shape of the work are easiest to manipulate just past the joining row. If you wait til you’re done, you’ll be fiddling a lot more trying to get at the insides. If you think of an easy way to crochet them shut on the joining row, we’d love to know! 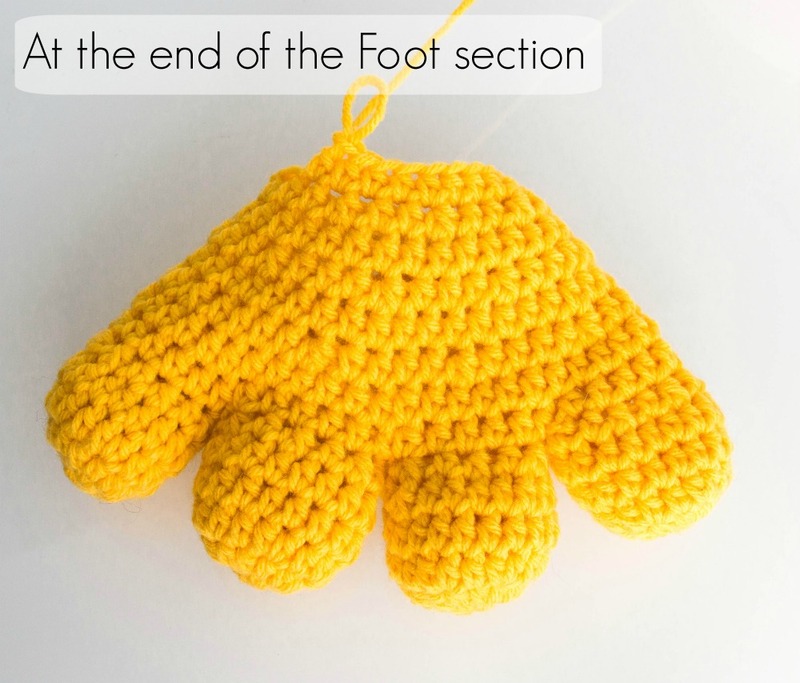 Since we covered decreases last week, you can now finish the Foot section of the pattern. Feel free to modify the pattern to get different foot shapes. You can play with how fast you decrease and how many rounds you do to get different angles and lengths. Everything up to the Heel section will stick out in front of the pole. We usually get a lot of questions on the Heel section of the pattern. Be sure to watch this week’s video above, where we explain each step visually. We’ve also answered some great heel-related questions in the group forum with more photos and mock-ups. Like, Where is the second chain from the hook? And Is this right? What is going on here? 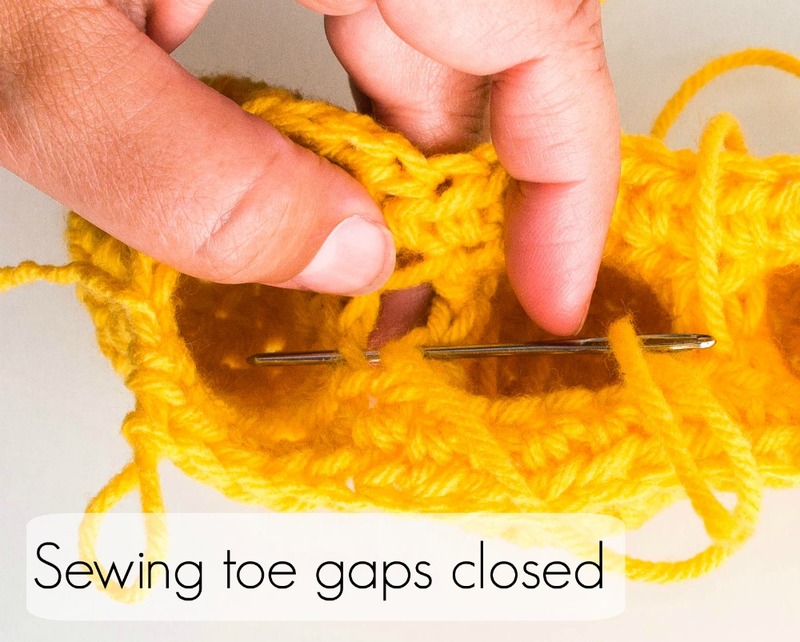 If you modified your feet, your foot round may have a different number of stitches. If so, make each flap half the round. Now it’s time to use the distance around your pole. If you’re still undecided or can’t get to it, you can still continue. In this week’s video we explain how to guess and what to do if you end up making your flap longer or shorter than you needed. Next week we rejoin the yarn and do the leg. After that it’s just appliqué and installing! One thing to notice at the end of this week: How are you doing on yarn? If you are using a big pole like a tree or a tall leg like a bike rack, you might need another ball of yarn for next week. If you’re not sure, use the forums for help. Leave us a pic of your project, leftovers, and installation site and we’ll help you estimate your yarn needs. New yarn bomb crochet pattern out today! You’ve seen our Monster Feet Slippers crochet pattern, but did you know it all started with yarn bombing? Back in 2013, we snuck monster feet on our local mailbox and the requests for a slipper pattern came pouring in. But we never published exactly how to crochet them as a yarn bomb until now. The best part is, we’re kicking it off with a virtual yarn-bomb-along, starting today! Our new Monster Feet Yarn Bomb crochet pattern includes three silly versions and teaches you how to crochet an attached leg for any size pole. It’s chock full of process photos, was professionally tested and edited, and uses just one typical ball of worsted weight acrylic yarn. Use it to make a monster in your neighborhood, or sneak a pair on some furniture in your home. Buy the pattern on Etsy or Ravelry, then join in the fun with the Monster Feet Yarn-Bomb-Along. Don’t worry, you can jump in at any time and catch up on all the details here. We are Lorna and Jill Watt. We are sisters who yarn bomb and design patterns for a living. Lorna likes bright, crazy things and Jill likes whimsy and cats. Basically, this is us. We live in the San Francisco Bay Area and work in our art studio. People think we’re twins, but you can tell us apart because Jill is usually wearing a cat shirt. Tell us about you! Join the Monster Feet Yarn-Bomb-Along Ravlery group and introduce yourself in the Introductions thread. The Ravlery group is where we will host our internet forum: essentially our cozy circle of virtual armchairs and yarn baskets. Bring your cats and your beverages–and all your questions and photos too. Ravelry.com is a free database for knitters and crocheters. If you don’t have an account, getting set up is free and easy. 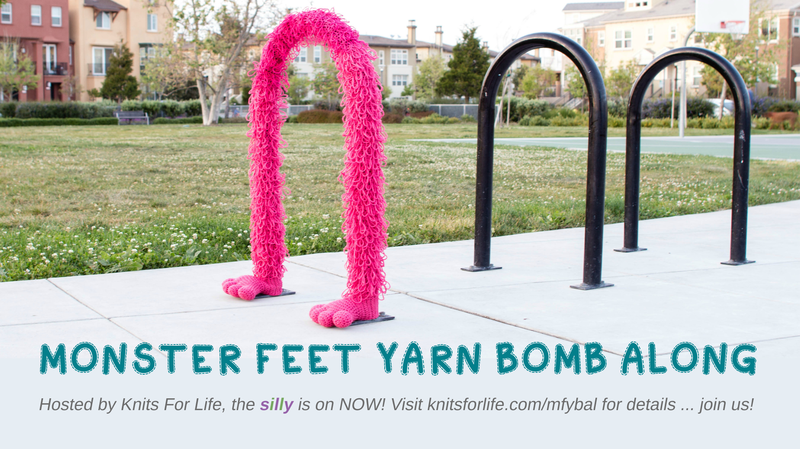 Once you’re logged in, navigate to groups and search for Monster Feet Yarn-Bomb-Along. Our hashtag around the web is #MFYBAL. Our new Monster Feet Yarn Bomb crochet pattern is now on Etsy and Ravelry. Purchase it and these other materials this week. Remember to check stores’ websites and apps for coupons! We like worsted weight because it’s widely available and makes a yarn bomb that’s a good size for most objects. That said, you can go as small or big as you like with your creation. The pattern will work with any weight yarn (and the appropriate hook). We like acrylic yarn because the fiber and color stand up to the elements (they’re even flame retardant). Natural fibers age and deteriorate much faster. That said, we advocate for removing acrylic yarn bombs from the environment before they become pollutants. Pictured is Red Heart Super Saver Yarn in Flamingo, Blue, Coffee, Gold, and White. One ball of Super Saver Yarn leaves enough extra to make very tall or thick legs. If you use yarn with a smaller ball, you may find yourself going over so make sure you get enough yarn. We like to use a high-contrast color so the details stand out. Pictured is Red Heart Super Saver Yarn in Delft Blue, Cafe Latte, Grenadine, and Flame. Gauge is not important, so use whatever size hook you have on hand or prefer. If you use a different weight yarn, remember to use an appropriate size hook. You’ll need this to sew closed the gaps between toes, sew on any toenails or claws, weave in your ends, and to sew the yarn bomb in place. We actually never use those fancy ones. Jill likes to use a bobby pin and Lorna uses the beginning yarn tail as a stitch marker. Lorna has been known to use toilet paper and plastic bags to stuff yarn bombs. This is our favorite yarn bombing tool! What colors did you pick? What yarn are you using? Post your materials in the Ravelry group! In the video above, we talk more about what makes a good yarn bomb location and how to measure. So make sure to watch it! Where are you thinking of putting your Monster Feet? Do you have any questions or concerns? How else can we help? Post your questions in the Ravelry group where we can all give you feedback and discuss it in our upcoming live video. This week you will take 2 measurements: the height and circumference of the object you want to yarn bomb. Easy! Because gauge is not important, you don’t need to make a swatch. Instead, you’ll use your work as your swatch at the end of week 3. At that point, the pattern text tells you how to use these two measurements to determine the size of the leg. So you can forget all about gauges and swatching and just focus on getting some fun materials and these two measurements. If you are feeling indecisive and need more time, get your measurements by week 3 at the latest. Ok, that’s a wrap for week 1. Chat at us in the Ravelry group and on Instagram, Facebook, and Twitter @knitsforlife and #MFYBAL! Throughout summer 2017 we’ll be knitting in the newly named Civic Center Commons in San Francisco, California. The Trust for Public Land is unveiling several new projects to make the three blocks it spans more lovable: Civic Center Plaza, Fulton Street, and UN Plaza. One of these projects is yarn bombing over 100 trees to visually connect the space with a tangible art installation that invites the community to connect with the space. You can take part in a bunch of ways! Lunchtime knitting machine demos: Come watch us demo the knitting machine we used to knit the commons on Tuesdays and Wednesdays in June. Full schedule: June 13-14 on Fulton Street; June 20-21 in UN Plaza; June 27-28 in Civic Center Plaza. Watch us install the first batch of yarn bombs throughout the Commons June 12-29, 11a-3p. Design next batch of trees with us! The first batch literally knits the new Civic Center Commons logo colors through the trees to visually link the three plazas together. The second batch is up to you! Vote on 3 designs we’ve proposed or dream one up yourself. Visit The Commons with your community group! If you haven’t been lately, there’s so much to see! Throughout the week there is so much else to see too: a pop-up playground, Off the Grid, farmer’s market, street market, Exploratorium pop-up exhibits, and cute tables and chairs with Tivoli lighting! Be sure to tag us @KnitsForLife in your pics so we can enjoy them and use the hashtag #KnittingTheCommons. How do you engage 25,000 people in one day? That was Visit Oakland‘s dilemma for the Oakland Raiders 2015 season opener at the Oakland Coliseum. Visit Oakland reached out to us to design a concept for both sides of the pedestrian bridge between the Coliseum and the BART rail station. Our guidelines: use this string art installation as our inspiration, maximize longevity, use Oakland’s team colors, use shapes that reference Oakland, add hashtags, and cover 150 feet over just two days.